I think the Chinese are smart. They have a lot of U.S. Treasuries and they want to get rid of them. And I think it is not just China. You have countries all around the world that have loaded up on U.S. Treasuries. They are going to sell. China is moving out of U.S. Treasuries and many other countries that have loaded up on U.S. Treasuries will likely follow. The easy part is to bring rates to zero, any central bank can do that. The impossible part is to lifting them back up again once you have got everyone addicted to zero interest rates. The easy part is to cut interest rates to zero. The impossible part is to raise them back up. The Federal Reserve will only be able to prevent a bear market in stocks if they launch QE 4. Without air, this bubble will just deflate. The U.S. Economy is sicker than ever thanks to the Federal Reserve. If the Fed were to actually deliver on the rate hikes that everybody think are coming we would have a worse financial crisis than in 2008. If the Federal Reserve goes ahead with an interest rate hike we will have another financial crisis, says Peter Schiff. The U.S. Economy is rapidly decelerating as the economic data as been getting worse and worse. We are stuck at zero rates. This is a gigantic bubble and the last thing the Federal Reserve wants is to prick it. But the air is coming out all by itself, just keeping rates at zero is not enough to support this market. The market unfortunetely is going to want another dosage of Quantitative Easing and that is exactly what Janet Yellen is going to deliver to the detriment of the real economy. Keeping rates at zero is enough to keep the stock market up. The market will soon demand another dosage of Quantitative Easing. A weakening U.S. Economy and turmoil overseas will be the excuses for the Federal Reserve to launch QE4. Peter Schiff explains how the Federal Reserve is going to lose control of this process and it is going to create an even bigger market crisis than in 2008. When I say the Fed is never going to raise rates, I am talking about on its own terms, because the Fed wants to. I know that eventually they are going to have to. See, that is another difference between me and Yellen, or something that Yellen does not understand. I know that at some point the Federal Reserve is going to lose control of this process and they are going to have to raise interest rates. And then it is going to be a complete catastrophe, it is going to be much worse. The crisis that the Fed is trying to avoid by keeping rates at zero is going to be much bigger when it is ultimately forced to raise them from zero and of course it is going to have to raise them much higher because it has waited so long. In the Q&A that immediatelly followed the official announcement Janet Yellen admitted that she could not rule out the possibility that interest rates would stay at zero forever! Janet Yellen actually admitted that interest rates could stay at zero ... forever. Peter Schiff explains in simple terms why the Federal Reserve is not likely to raise interest rates later today in the most anticipated FOMC meeting in many years. That`s what they are worried about. They are worried about pricking it. That is the serious error that this former Yellen aid is talking about. It`s a recognition that this economy is a bubble and that it will be an error to prick that bubble. Peter Schiff does not expect the Federal Reserve to raise interest rates this week in a highly anticipated Fed meeting. Peter Schiff highlights the roll of excuses that the Federal Reserve may come up with to not raise interest rates later this week. As long as the Federal Reserve is willing to bluff, as long as the Fed is able to pretend that they can raise interest rates, then everybody can pretend that what the Fed did work. But the minute they raise interest rates and prove that the economy cannot withstand higher rates then they expose everything and that is why they do not want to do it. The Federal Reserve will have to do QE4 regardless. Even if they get interest rates to 0.50% and then the next recession starts. There is not a lot of ammunition. Normally when there is a recession the Fed is at 5.00%, they have a long way to reduce interest rates. Going from 5.00% to zero is a much bigger Keynesian stimulus than going from 0.50% to zero. I think if they raise interest rates and then they have to go to zero they will look like fools. With the inventory to sales ratio at recession levels in the auto industry we may be just witnessing the bursting of another bubble, the automobile bubble. The recent surge in volatility is likely to be indicating a change in the stock market`s trend. Peter Schiff explains why the stock market still has a long way to go on the downside. Peter Schiff sees the rising volatility in the stock market as a signal that the trend has changed. Peter Schiff explains what he sees ahead for the stock market and the U.S. Economy. We are going to have a bear market if the Federal Reserve continues to maintain their pretense that it is about to raise interest rates wether its in September, October, December... As long as that is overhanging in the market, the market is going lower. Peter Schiff: "U.S. Dollar: Interest Rate Hike Is Priced In"
Peter Schiff considers the U.S. Dollar may indeed trade down even if the Fed raises interest rates next week. If the Federal Reserve keeps insisting in raising interest rates then the stock market is likely to be heading lower. 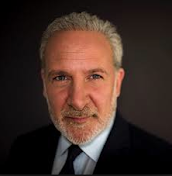 Peter Schiff still sees better opportunities to invest abroad and he highlights some safe haven countries. Peter Schiff explains that with the economy slowing down, corporate profits going down and the Federal Reserve threatening to remove liquidity, there is no reason to own stocks. That may change if the Federal Reserve launches QE4.